How serendipitous is this? Just as Hilary Swank buys the rights to the French Women Don’t Get Fat book (see item above), written by a female exec of the Champagne house Veuve Clicquot, here comes a book about the founder of that company. 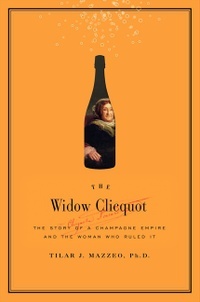 It’s called The Widow Clicquot: The History of a Champagne Empire and the Woman Who Ruled it. The book stars Barbe–Nicole Clicquot Ponsardin (1777–1866) as the “veuve,” which is French for widow. After the death of her husband, whatshisname, she took over the winery and made it a success. He gets no credit at all. Question: Are bad sommeliers a menace to wine? 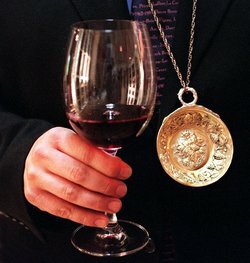 Today’s Question of the Week: Are bad sommeliers a menace to society? Now, I love sommeliers. They’re fellow hedonists, always ready to schmooze about the glories of wine. But I have seen the occasional one going around the table filling everybody’s glass to the brim. This makes it impossible to swirl, and it tends to empty the bottle, pressuring the host to buy another, even if some of the diners aren’t finishing their overfilled glasses. And it’s hard to tell them to stop it without creating a fuss, which can put a damper on a nice meal. Wine fans, read the whole article and tell me what you think. Sommeliers, how do you react to this? Click on the "comments" icon below. Question of the week: What are you drinking? Question of the week: What are you drinking these days? Now that so much of your paycheck goes into groceries and filling your SUV, are you trading down in wine? A new Nielsen study says wine sales are still rising in 2008, but much more slowly than last year. And the biggest drop in growth is in the $15-a-bottle-and-up category. Are you finding some gems for less than $15? If so, share the wealth. Tell us what you’re drinking. Tell us the price, and how they taste. Click on the “comments” icon below.